**Verses 16-17 show the Deity. God draws the sinner to repentance. Ephesians 1:7 In him we have redemption through his blood, the forgiveness of sins, in accordance with the riches of God’s grace 8 that he lavished on us. After Jesus’ death and burial but before his resurrection, He was in the heart of the earth for 3 days. This is when Jesus got the keys to death and hades and bridged the gap between being lost for eternity and the kingdom of God for us. Revelation 1:18 I am the Living One; I was dead, and now look, I am alive for ever and ever! And I hold the keys of death and Hades. Notice the words ‘come near’ in verse 15. The hearer would have still been under the Old Covenant coming into the New Covenant, as Jesus is speaking. The New Covenant was not yet implemented until after the baptism of the Holy Spirit in Acts chapter 2. John preached a baptism of repentance via water. Under the New Covenant, a new commandment is added to the believer. Repentance AND baptism is then preached. There are two baptisms mentioned in Scripture. John’s baptism (the baptism of repentence), to become a disciple by being baptized into the name of the Father, the Son and the Holy Spirit. And the baptism of the Holy Spirit, being baptized into the name of Jesus Christ. 4 Paul said, “John’s baptism was a baptism of repentance. He told the people to believe in the one coming after him, that is, in Jesus.” 5 On hearing this, they were baptized in the name of the Lord Jesus. 6 When Paul placed his hands on them, the Holy Spirit came on them, and they spoke in tongues and prophesied.7 There were about twelve men in all. *Notice also the Holy Spirit came by the laying on of hands. Being baptized for repentance and forgiveness of sins (John’s baptism) was done while Jesus was on earth before he defeated death. 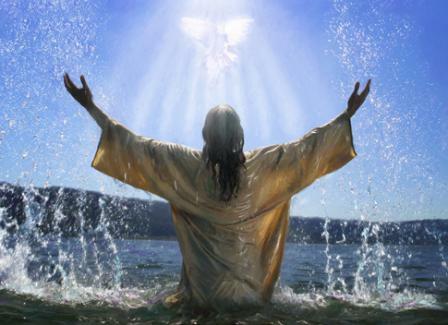 After he ascended to the Father and sent the Holy Spirit to us, we are now baptized into Christ. This is the baptism of the Holy Spirit. We literally die to self in this baptism, are filled with the Holy Spirit and are resurrected into life through the Spirit and become a new creature in Christ. This is the sign of the New Covenant. In Luke 17:21, it was speaking of the fulfillment of the New Covenant that was in the near future, when the kingdom of God dwells ‘within you’ via the Holy Spirit. Therefore, we receive the baptism of the Holy Spirit after we repent, our old self dies, is buried in a water baptism and we emerge (resurrect) from the water and through the laying on of hands. We then become part of the kingdom of God and are a new creature in Christ. John 3:5 Jesus answered, “Very truly I tell you, no one can enter the kingdom of God unless they are born of water and the Spirit. **Others have tried to use Nicodemus’ encounter with Jesus later in this chapter to refute that the water mentioned in verse 5 could not be in reference to baptism because this meeting happened under the Old Covenant. However, they fail to take into account that Nicodemus more than likely died after Jesus’ crucifixion/Pentecost, meaning Nicodemus died under the New Covenant. Luke 24:46-47 And said unto them, Thus it is written, and thus it behooved Christ to suffer, and to rise from the dead the third day: And that repentance and remission of sins should be preached in his name among all nations, beginning at Jerusalem. Christ was the firstfruits (of the Old Covenant believers who were sanctified first) and it is ‘in Him’ that we become part of the kingdom of God through water baptism and baptism by the Spirit under the New Covenant in the name of Jesus. I Corinthians 15:20-29 But Christ has indeed been raised from the dead, the firstfruits of those who have fallen asleep. 21 For since death came through a man, the resurrection of the dead comes also through a man. 22 For as in Adam all die, so in Christ all will be made alive. 23 But each in turn: Christ, the firstfruits; then, when he comes, those who belong to him.24 Then the end will come, when he hands over the kingdom to God the Father after he has destroyed all dominion, authority and power. 25 For he must reign until he has put all his enemies under his feet. 26 The last enemy to be destroyed is death. 27 For he “has put everything under his feet.” Now when it says that “everything” has been put under him, it is clear that this does not include God himself, who put everything under Christ. 28 When he has done this, then the Son himself will be made subject to him who put everything under him, so that God may be all in all. 29 Now if there is no resurrection, what will those do who are baptized for the dead? If the dead are not raised at all, why are people baptized for them? When the day of Pentecost came, they were all together in one place.2 Suddenly a sound like the blowing of a violent wind came from heaven and filled the whole house where they were sitting. 3 They saw what seemed to be tongues of fire that separated and came to rest on each of them. 4 All of them were filled with the Holy Spirit and began to speak in other tongues as the Spirit enabled them. Baptism is not the work of man. It is the work of the Deity!! The Deity takes over in all three steps! Colossians 2:9-14 For in Christ all the fullness of the Deity lives in bodily form, 10 and in Christ you have been brought to fullness. He is the head over every power and authority. 11 In him you were also circumcised with a circumcision not performed by human hands. Your whole self ruled by the flesh was put off when you were circumcised by Christ, 12 having been buried with him in baptism, in which you were also raised with him through your faith in the working of God, who raised him from the dead. When you were dead in your sins and in the uncircumcision of your flesh, God made you alive with Christ. He forgave us all our sins,14 having canceled the charge of our legal indebtedness, which stood against us and condemned us; he has taken it away, nailing it to the cross. So, water baptism in the name of Jesus is necessary to enter the kingdom of God. It symbolizes repentance and the death and burial of the old self and the resurrection of the new creature in Christ through the baptism of the Holy Spirit! Colossians 1:24-27 Now I rejoice in what I am suffering for you, and I fill up in my flesh what is still lacking in regard to Christ’s afflictions, for the sake of his body, which is the church. 25 I have become its servant by the commission God gave me to present to you the word of God in its fullness— 26 the mystery that has been kept hidden for ages and generations, but is now disclosed to the Lord’s people. 27 To them God has chosen to make known among the Gentiles the glorious riches of this mystery, which is Christ in you, the hope of glory. 28 He is the one we proclaim, admonishing and teaching everyone with all wisdom, so that we may present everyone fully mature in Christ. 29 To this end I strenuously contend with all the energy Christ so powerfully works in me. The baptism by the Deity is what makes us fully mature in Christ! In verse 15, we see that John the Baptist, being born under the Old Covenant (before Christ defeated death) and also dying in Matthew 14 by being beheaded by Herod while Jesus was still alive, meaning he also died under the Old Covenant, was filled with the Holy Spirit even before he was born! Being filled with the Holy Spirit under the Old Covenant is a first and only that I’m aware of anywhere in Scripture! Now why could this have been? Notice how John thought he needed to be baptized but Jesus did not entertain the idea! It is because John was already filled with the Holy Spirit in the womb so that he could baptize Jesus and Jesus knew this! Also, John dying under the Old Covenant meant that he did not have to fulfill the requirements of the New Covenant of being born of water AND Spirit (John 3:5), which would further explain why he did not have to be baptized by water and why there is no mention of his baptism in Scripture. (**Remember, as pointed out earlier, Nicodemus more then likely died under the New Covenant and this conversation of being born of water and Spirit was spoken to him.) These instances with Nicodemus and John biblically point to an eye opening realization of the differences between the sanctification methods of the Old and New Covenant. Luke 1:16 He [John] will bring back many of the people of Israel to the Lord their God, implies that John the Baptist brought hope of the coming fulfillment of the sanctification of the Holy Spirit to those who died under the Old Covenant. This revelation gives a whole new depth to the importance of Baptism and further illustrates the point that Baptism in the name of Jesus is indeed an act of the Deity and the sign of the New Covenant! It is how New Covenant believers get ‘in Christ‘ and become sanctified!